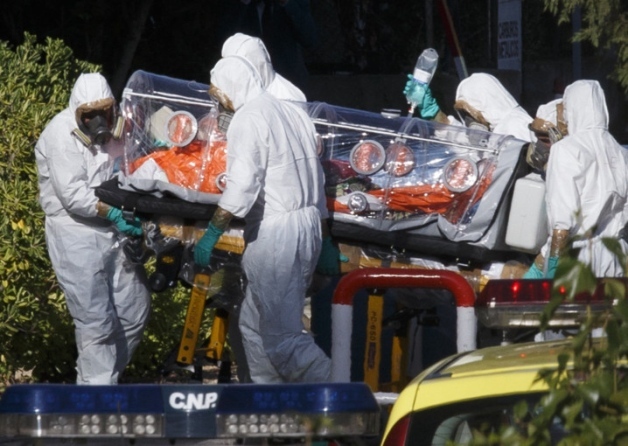 A nurse who had served on the team that treated a Spanish priest who contracted the disease in West Africa has become the first Ebola case in Europe. She is also the first person to have contracted the disease outside Africa, despite the highest level of precautions having been taken. The nurse tested positive for Ebola in two tests. The woman was part of the team that had treated priest Manuel Garcia Viejo, a Spaniard who died Sept. 25 in a Spanish hospital after contracting the disease in Liberia. The nurse began to feel ill last week while on holiday, and was admitted to a hospital near Madrid on Monday morning with high fever, according to Health Minister Ana Mato. No information has been reported regarding those who would have been exposed to the woman during her illness. The nurse is being held in quarantine in Spain, and is reported to be in stable condition. The disease, which is spreading rapidly–with cases doubling every three weeks in West Africa–has killed 3,400 of at least 7,500 confirmed cases of infection–although the actual number is suspected to be much higher. Currently, over one hundred people are dying within 24 hour periods. Ebola spreads through contact with any bodily fluids of an infected person. The only means of stopping the spread of the disease is isolation, according to authorities. Despite numerous calls by politicians and experts for travel restrictions, the US and other nations have rejected any travel restrictions to the affected areas.